Remote locations are the reason Guard House with Restroom (guard shack with toilet) is a specialty at Little Buildings, Inc. When other facilities are too far away and require a secure area to be unmanned during a privacy break, we have the answer! 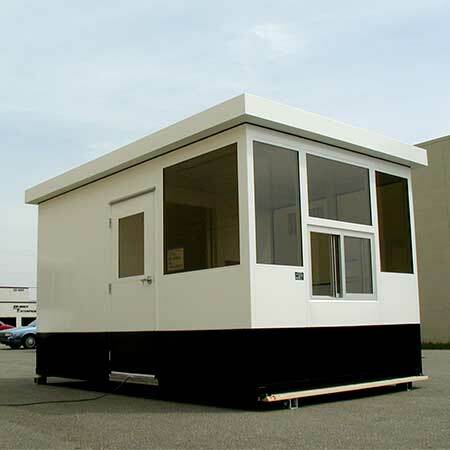 Larger guard house can be fitted with optional restroom complete with sink, toilet, water heater, mirror, handicap handrails, partition wall with privacy door, light, GFCI electrical outlet, and exhaust fan - all standard! Entrance door on your Portable Restroom is usually from the inside but can be moved to the outside if preferred. 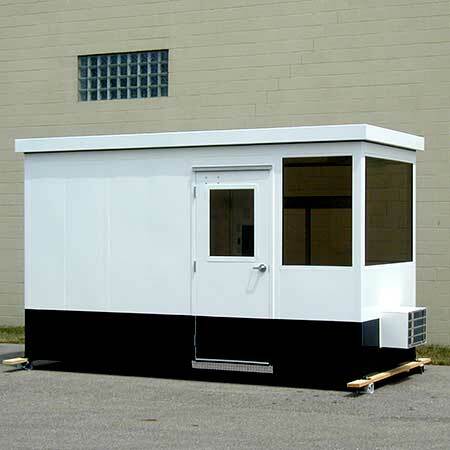 Each Little Building Portable Guard House with Restroom starts from the base up so we can modify the unit to meet your exact requirements. Final plumbing fixture installation, pipe, and piping by others in field. Have questions? Feel free to contact us to get the answers you need to make your Portable Guard House with Restroom purchase decision with confidence. Should you already have a sketch of what you need you can email it to us by filling out our contact form on our Contact Page for a quotation. 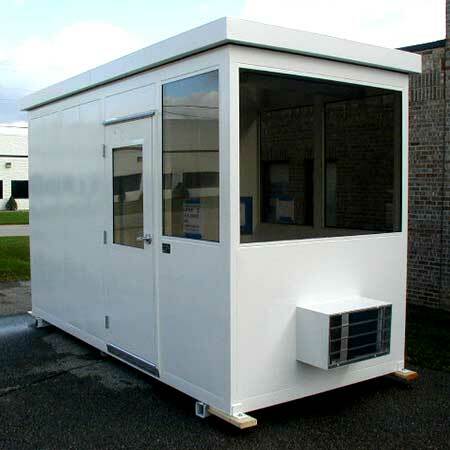 Little Buildings are the highest quality Security Booth with Restroom on the market yet still are very competitively priced. Built from tough, galvanized steel for superior strength and longevity. Mig welded frames and panels assure they withstand years of rugged use. While competitors may offer a Security Booth with Bathroom the same size, they may be constructed from plywood with thin layers of aluminum that are merely riveted together. Make sure you get the most value for your money by buying a quality, reliable Security Booth with Restroom from Little Buildings, Inc. What else can you get? 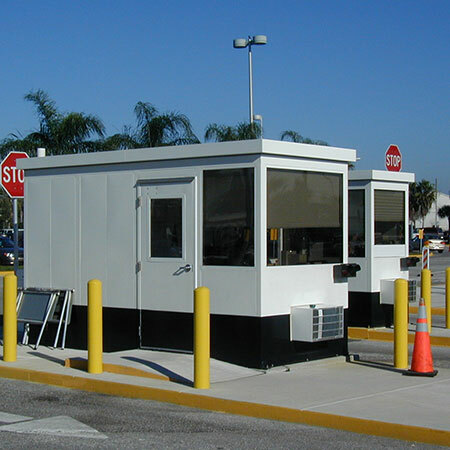 Preassembled Guard House with Restroom options include tinted insulated glass, aluminum treadplate or anti-fatigue mat floor, stainless steel counter tops, transaction windows, exterior lighting, exterior shelf, roll-down security shutters, and roll-down sun shades for maximum sunlight reduction. You can also order your Guard Shack with toilet to include fire extinguishers, phone and data outlets, surge suppressors (individual outlet or entire building protection) and CCTV raceways and mounting areas. Contact your Little Buildings Security Shack with restroom specialist to discuss your requirements! Some options may be shown. Little Buildings reserves the right to change and improve the Guard Shack with Bathroom features and design at any time. Shop drawings will be provided for final approval after order.